Former Virginia Gov. 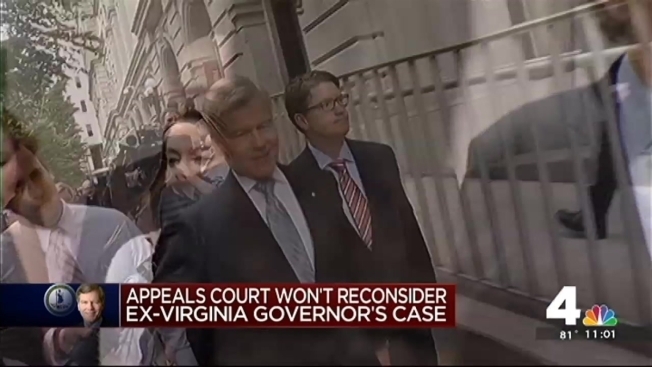 Bob McDonnell will appeal his public corruption convictions to the U.S. Supreme Court now that a federal appeals court has rejected his bid for a rehearing, one of his lawyers said Tuesday. McDonnell could file a petition asking that he remain free until the Supreme Court decides whether to take his case. But Carl Tobias, a University of Richmond law professor who closely follows the Richmond-based appeals court, said it's likely that McDonnell will have to report to prison soon. In its brief order Tuesday, the full 15-member 4th U.S. Circuit Court of Appeals said eight judges voted against reconsidering the panel's decision to uphold McDonnell's convictions. Seven others, "deeming themselves disqualified, did not participate,'' the order said. No explanation was given for what Tobias called an unusually large number of recusals. McDonnell said he was disappointed by the ruling. "I will continue my journey for justice to the highest court in the United States," he said in a statement issued Tuesday evening. "I look forward to the day when vindication is obtained and my family’s good name is fully restored." Barry J. Pollack, a white-collar defense attorney in Washington who has followed the McDonnell case, said McDonnell's failure to get a single appeals court judge to agree to rehearing will not affect his chances of getting the Supreme Court to take the case. "The Supreme Court's primary consideration is going to be the gravity of the issues and whether they feel there has been enough of these cases that there's confusion among the judicial circuits about what the standard should be,'' Pollack said. The Richmond-based appeals court has scheduled oral arguments in Maureen McDonnell's case for late October. According to trial testimony, Williams showered the McDonnells with lavish gifts - including a Rolex watch for the governor, about $20,000 in designer clothing for the first lady and $15,000 to pay for catering at a daughter's wedding - while the former Star Scientific Inc. president sought state university research on his company's signature product. He also loaned the McDonnells thousands of dollars on exceptionally favorable terms to help them pay off debt and keep their money-losing Virginia Beach vacation rental properties afloat. Meanwhile, the McDonnells attended promotional events and hosted a product launch event for Anatabloc, the tobacco-derived anti-inflammatory manufactured by Williams' company. Bob McDonnell also arranged meetings with administration officials for Williams, who wanted not only the university research but also inclusion of Anatabloc in the state's employee health plan.